Skip the bagel. Offer hope instead! What can YOU give up to provide hope this Easter? 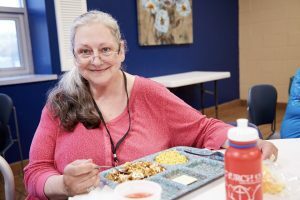 At Wheeler Mission, we regularly say that hope starts with a single meal. When our guests walk through our doors for the first time, they so often come hungry, lonely, weary, and worn. Their joy, dreams, and hope are gone. So what do we do first? It seems so insignificant. But friends, that one single meal, that first act of kindness, nourishes the body and begins to restore hope. A meal is the first step on the road toward recovery, healing, stability…and lasting joy. And we invite you to be a part of it all! At Wheeler Mission, you can provide a meal, that first bit of hope, for just $2.25! That’s less than a cafe latte, a bagel and cream cheese, or even an appetizer! Pretty simple, isn’t it? Please join us in providing help, hope, and healing to our neighbors this Easter. What can YOU give up to provide hope to your homeless neighbors this Easter?